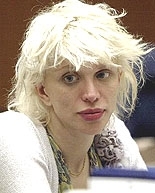 JUNE 9--Courtney Love has been charged with felony assault for allegedly battering a fellow female rock singer with a liquor bottle and metal flashlight during an April attack at the same Los Angeles home where the troubled performer was arrested last October. A spokesperson for the L.A. district attorney said the April 25 confrontation occurred at the home of Jim Barber, Love's ex-boyfriend (that's where she was arrested last fall for breaking windows, the first of several busts involving drugs and smacking people). According to a TSG source familiar with details of the incident, Love arrived at Barber's home that morning and, once inside, began throttling the music producer. The victim, who does not know Love and was sleeping on a living room couch when the melee started, got injured when Love picked up a nearby bottle of booze and crowned her with it.